It's time for another wonderful challenge over at Frilly and Funkie! This time Nicole is our lovely hostess and she has chosen the theme SPRINGTIME DIE CUTS. She would like you to create a shabby chic or vintage style project celebrating Springtime and remember to include die cuts. One lucky winner will receive a $25 gift certificate to Linda's shop The Funkie Junkie Boutique! This month the world celebrates Earth Day on the 22nd, so I thought I would put a green foot forward and make a card almost completely out of recycled Kraft Paper. The butterflies, the tags, the flowers, the leaves, the lattice and the wood backing are all made out of Kraft paper. Hope you enjoy my Spring Earth Day card. The bottom layer is another new attempt at a wood technique, I love experimenting with natural textures. This time I coated the wood with Wendy Vecchi crackle paste and then treated it with various Tim Holtz inks and sprays and let it dribble up and down to create the grain. The top tag was coated with Picket Fence crackle paint and coloured with Shabby Shutters and Tumbled Glass sprays and then some more dripping with Gathered Twigs and Peeled Paint. The sentiment is from the new Graphic 45 series called Time to Flourish. I stamped it with Ranger Coffee Archival ink and then fussy cut it out and coloured it with Copic markers. On the bottom tag I used the Tim Holtz Flourish stencil and some crackle paste and then dripped distress sprays into the cracks. The leaves were dabbed with Picket Fence paint and then sprayed with Peeled Paint spray. The large butterflies were treated with Tumbled Glass, Shabby Shutters and Peeled Paint and dabbed with Picket Fence. The small butterflies were coloured with Wild Honey, Scattered Straw and Squeezed Lemonade. The pearls are from the new Kaisercraft collection, this colour is called Chino, a beautiful vintage colour of pearl now available at Linda's shop. The flowers were coated with Picket Fence crackle paint and then I dripped Victorian Velvet spray all over the petals. The doily is one of the only pieces cut from regular white card stock. 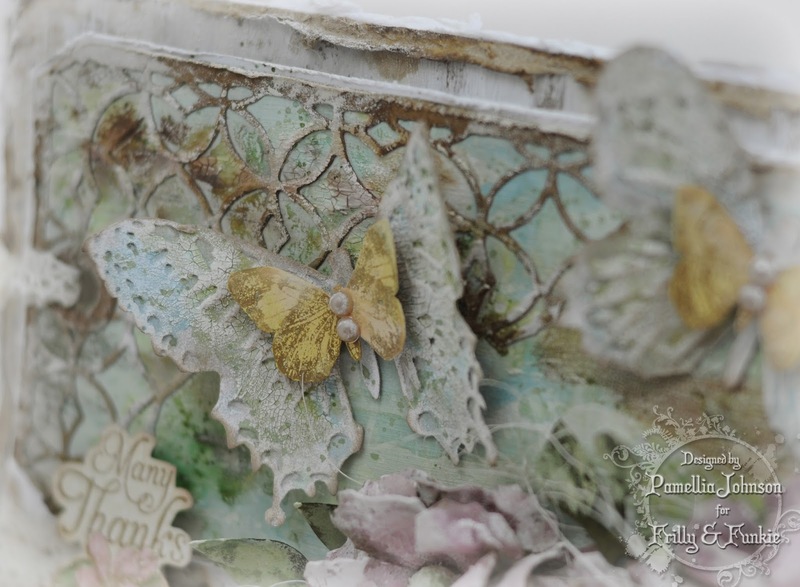 This is a stunning card with all the textures and wonderful die cut makes. This is stunning Pamellia. I love the soft colours and all your detailing is so beautiful. OMG Pamellia this is stunning, so much beautiful detail, awesome. Love the wispy, ethereal (get me with the big word lol!) feel along with your usual fab dimension. A real beauty. You could also enter this at House of Cards again as this has the butterflies too. Stunning Pamellia, so vintage and shabby chic looking but also earthy, just beautiful, love every bit of it, amazing work. Just lovely card, Pamellia, love all on it. A masterpiece again. Wow, Pamellia! This is beyond gorgeous! You have so many incredible details. Love it! WOW!!! Pamellia, this is one breathtaking card!!! Also, the flowers have hypnotizing effect, at least on me, cause I could not get my eyes off of them!!! It took a while and some super extra will power to move my eyes from them! There are so many gorgeous details on this card, I don't even know where to begin with my praise?!?! I guess I'll start with hypnotizing flowers :) The color and aged look of them is outrageously gorgeous!!! The peeking doily is such a fantastic touch! Butterflies look out of this world, the tags are so beautifully arranged and designed and the wood background looks amazing!!! Tutorial please!!! Another FAB-U-LOUS card. I love the tags as layers and of course all the wonderful texture. The flowers are sooooo pretty as are the layered butterflies. As always a real stunner Pamellia. It never fails to amaze me how you draw all the elements together as if that was just how they were intended - if I did the same they would look like a jumble sale. Another WOWER in my mind.. I so adore your style Pamellia! Masterly! Another stunner Pamellia.....I keep going over the pictures and am always amazed at the beautiful detail. 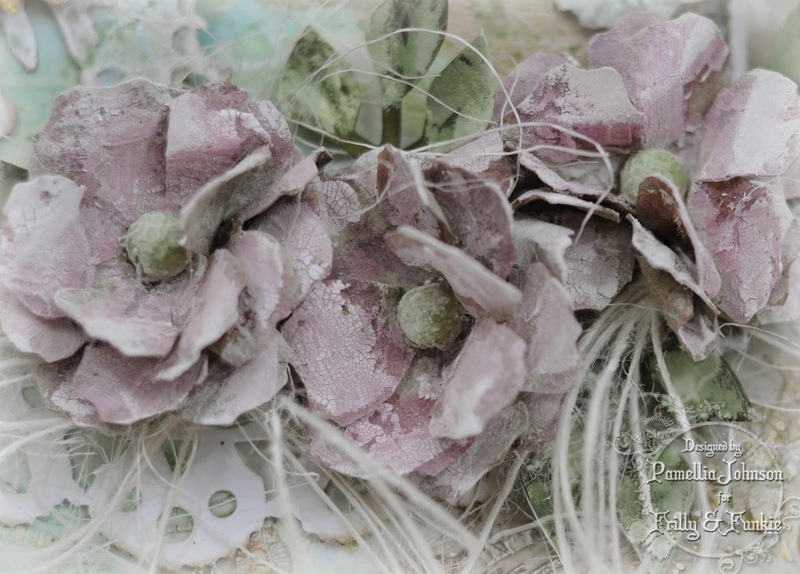 The texture just sings out on this Pamellia,I really adore your flowers,they look like real flowers that have been preserved,you really are one wonderful artiste! Wow a super, gorgeous card Pamellia. Love all the textures and soft colours. A fabulous design and so well thought out and put together. You sure DID go completely earthy! Your creations and attention to detail always amaze me. Thanks for joining us at Shopping Our Stash! Another gorgeous butterfly card. Very pretty and so much detail. Magnificent... just love all these crackles, drips, sprays and paints topping the fabulous TH dies. Can't get any better than this... LOVE it!!! I always admire how you manage to create a true microcosm with your single creations, Pamellia! Layers, textures and colours weave a whole little wonderland-universe to wander in. Thank you for all the wonderful close ups - they reveal the magic so beautifully. Absolutely stunning card, Pamellia! Can't take my eyes of this beauty! Love all the fabulous layers there and how you arranged everything together! 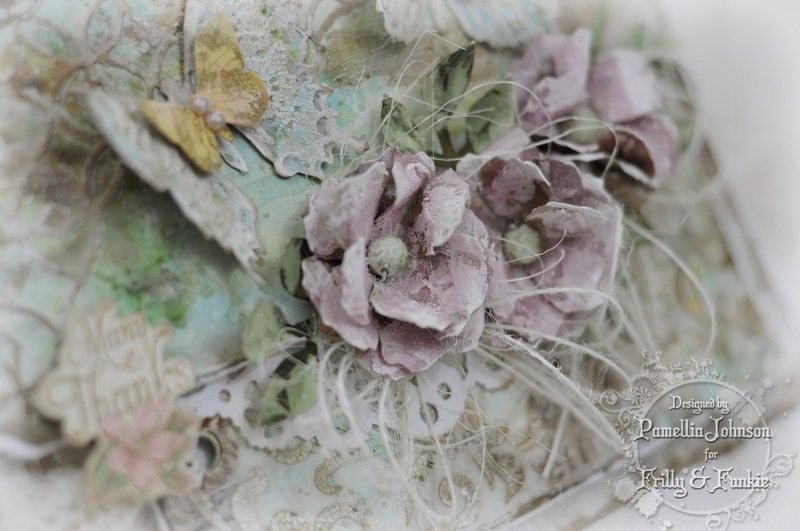 The flowers, the textures and all the embellishments are so well incorporated in this amazing vintage creation! Gorgeous! Thank you for sharing in our gallery at The Kraft Journal! Beautifully composed and executed! Thanks so much for accepting the challenge this week at Shopping Our Stash! So beautiful card!! Thank you for playing along with us at Creative Card Crew. Beautiful Pamellia, you never cease to amaze me with your talent! This is just AMAZING, I love everything about it especially the flowers. Fantastic, as always Pamellia! 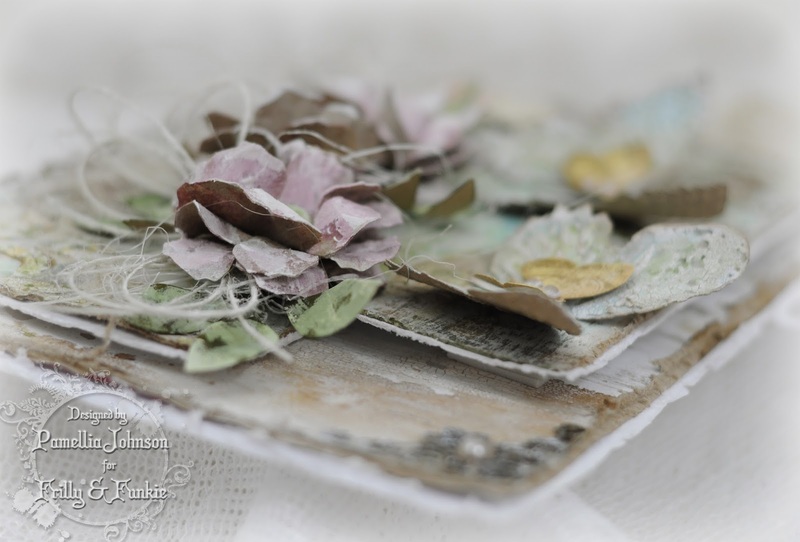 I love diving into the sea of gorgeous details your card offers to the eyes. I just love your gorgeous cards Pamellia! I could look at all of the little details all day. Totally gorgeous, you always include so many wonderful details for us to admire. 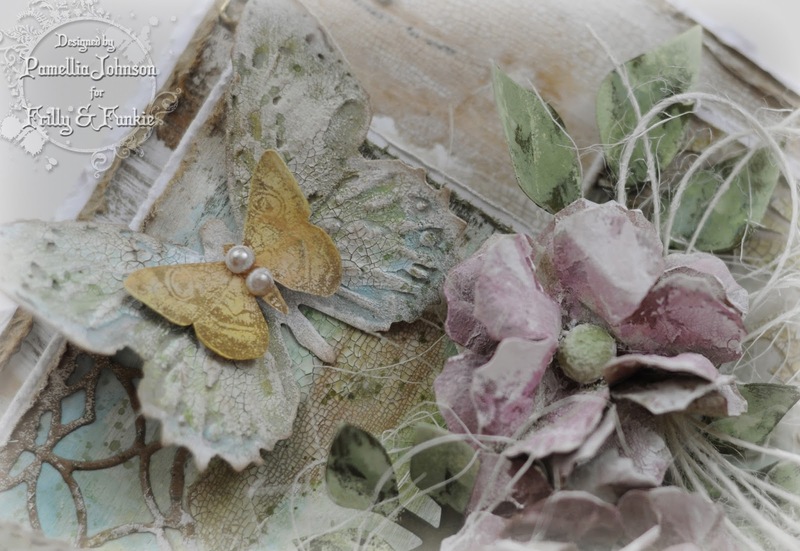 This is stunning Pamelia, such lovely soft colours and gorgeous details - your flowers and butterflies are beautiful. Lovely card!! I would never have thought to use crackle paint on flowers, great idea love how it looks. and the Jute/ribbon behind the flowers just sets them off. You did a great job on recycling-I love doing that with various items in the house. Thanks for joining us at Creative Card Crew. Beautiful card. Great way to recycle. C'est très magnifique! I had to use my limited French because this is beautiful and the French language is beautiful. The layers, the colors, the die cuts, the flowers, the dribbles, the crackles, the doilie, the tag, the Copics, the butterflies, the Chino! What what? Chino? Ummm, okay! I could just eat this up Bubbles! Amazeballs! Hugz to you muffin! LOVE the tags and all of the shabby layers! GORGEOUS card, Pamellia! 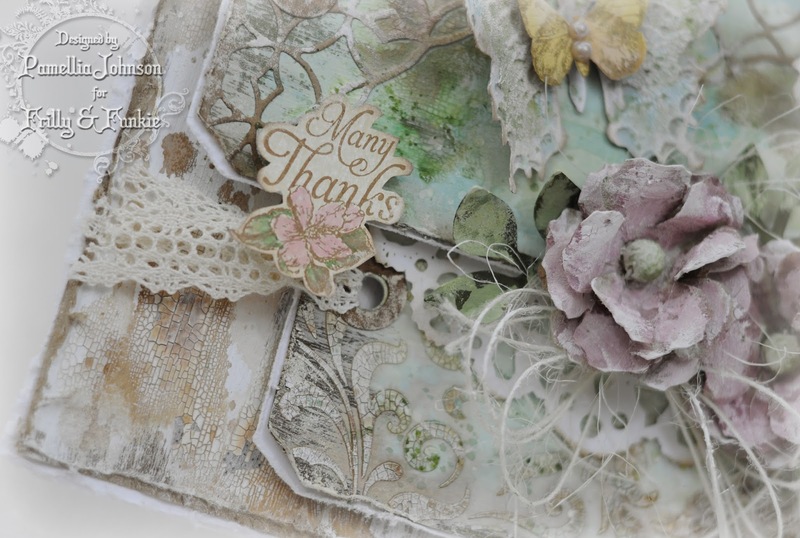 Just another gorgeous card Pamellia, loving the layers and textures. 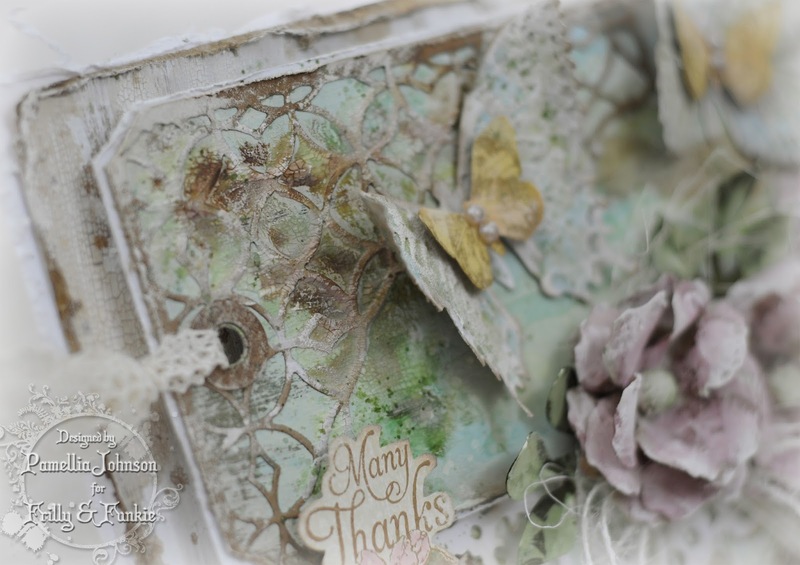 Stunning Pamellia, gorgeous colours and textures and I just love how you incorporated the tags, the whole card looks amazing!! Beautiful! Lots of wonderful crackle, and those flowers are gorgeous. Lovely Earth Day card. Amazing. That faux wood looks really lovely! And all the texture on those tags... Yummy! 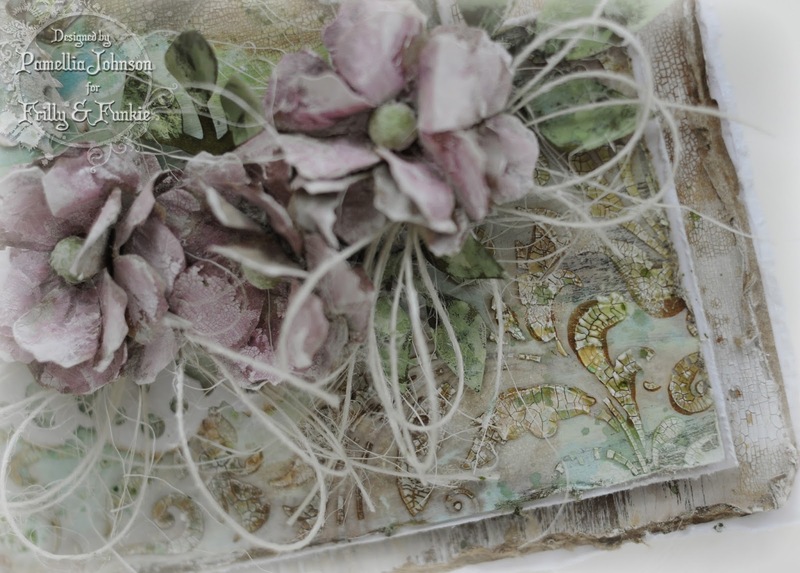 I am always amazed at all the wonderful layers and textures you have on your creations - this is beautiful Pamellia! This is stunning Pamellia! 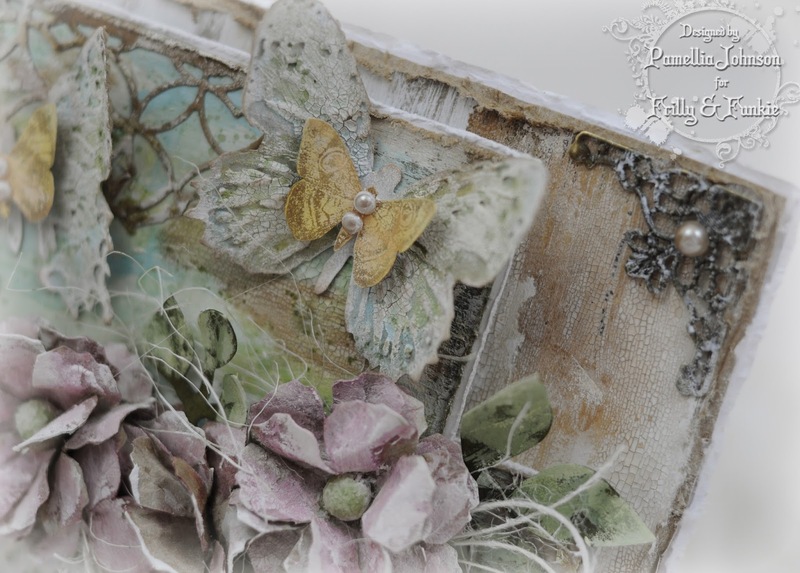 I love the flowers and your gorgeous layered butterflies, fabulous textures as always! This is just fabulous, Pamellia! What incredible, beautiful details! Simply gorgeous! Thanks for joining in at My Time to Craft! Wow this si gorgeous loving the softness of this card . So much detail the flowers are beautiful as well as the butterflies. Oh, I'm loving this card! The flowers are scrumpdiliicous! I'm so stealing your idea of crackle paint! Now about this wood--is this real wood? Cause it sure looks like real wood to me! Seriously?? I have got to know how you did that! (I will pay big bucks!) Every detail is just amazing, Pamellia! Love those double decker butterflies, and I have got to get those--not on the wish list any longer--they are on the need- this- immediately list! You are just one amazingly talented person! Hugs! Fabulous design Pamellia, I love the double butterflies and the stunning flowers. I really must have another go at mixed media. This is STUNNING! It's such a blessing to have you share your talents in our challenge, and I sincerely hope that you will continue to play along in our weekly challenges. Fantastic card Pamellia! Love all the textures and the pretty soft colours! Thanks for playing along with the SHOPPING OUR STASH crew for our joint "The Earth Has Music" challenge with Words 2 Scrap By!! 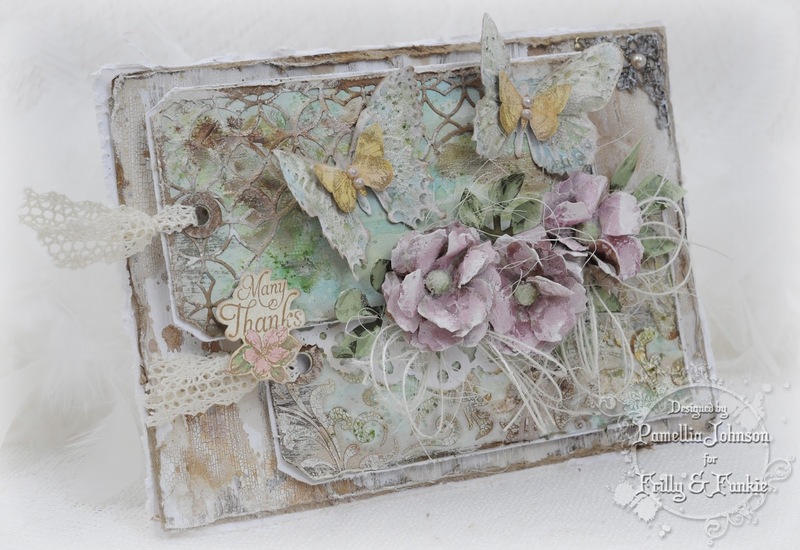 Absolutely stunning shabby chic card, Pamellia - so light and delicate and dimensional - wonderful work with the die-cuts theme - I love it! You do such an amazing job with layers, Pamellia. The textures and colors are fabulous. The flowers, as always, are incredible and I love the way you incorporated the tags and Mixed Media die cut! And using recycled kraft paper is the icing on the cake! Sensational work as always. So very pretty! Love the gorgeous blooms and beautiful butterflies fluttering about! Thanks for joining along with the Simon Says Stamp Monday challenge! Wow, wow, wow! This is absolutely stunning! I love your design with the tags and those flowers and layered butterflies are incredibly beautiful. Wow, this is so gorgeous. I love all the texture and detail you have added so wonderfully. Beautiful as always Pamellia! I'm glad we're now connected through social media and stuff. I love this card you made for the challenge... You work magic with that crackle baby! lol I love to add crackle paste to my mixed media projects and though I have other sorts of paste I usually just want to use the crackle one. I need to get crackle paint both white and transparent to keep crackling the world lol! I could barely make myself scroll down, because I just couldn't stop looking at this piece of art. Breath taking! All those butterflies and flowers ... Wow! You know how much I love those stuff! :D Way to go to try something new again and for all the recycling. I should definitely do more of those too. Absolutely stunning Pamellia, so much to see and take in, just gorgeous! So sorry to not have visited recently, your lovely blog disappeared off my blogroll at Bloglovin for some reason :O( Have you back now and have lots of catching up to do!